‘This collection of articles under the title Land and Liberty was ﬁrst published by the Organising Junta of the Mexican Liberal Party in Los Angeles, California, in 1913. It was intended to be the ﬁrst of a series of booklets to explain to English speaking readers, mainly in North America, the aims and ideas of the Mexican Liberal Party, and the true social aspect of the Mexican Revolution ignored by the general press. Some of articles published in ‘Land and Liberty’ first appeared in Regeneración during the years 1910-1912 and were written by Ricardo Flores Magón, William C. Owen and Antonio de P. Araujo. 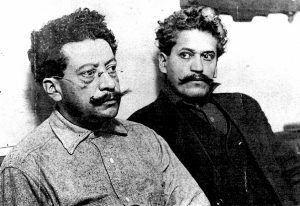 Ricardo Flores Magón, although almost unknown outside his native Mexico, was the most important anarchist active during the Mexican Revolution, and through his inﬂuence large areas of land were expropriated by the peasants, many former slaves, and worked in common by them. He not only opposed and fought against the dictatorship of Porfirio Díaz, but also against all the so-called revolutionary leaders who came to power after the latter’ downfall in 1911. Ricardo ceaselessly strove to direct the struggle of the working people away from mere helpless participation in a political revolution to creating for themselves a truly social revolution based on anarchist-communism, where they could live and work without the recourse to leader or master. 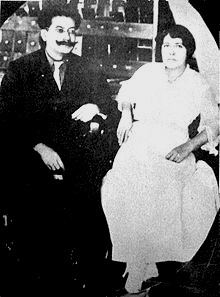 Ricardo Flores Magón was born on September 16th 1874 in San Antonio Eloxochitlán, Oaxaca State, the second of three sons of a Zapotec Indian father and a Mestiza mother. While still young his family moved to Mexico City where Ricardo was able to attend the Escuela Nacional Primaria and later the Escuela Nacional Preparatoria. It was while at this school, in May 1892, that he took part in his ﬁrst protest against the dictatorship of Porﬁrio Díaz for which he was charged with sedition and sentenced to five months imprisonment. The following year he graduated to the Escuela Nacional de Jurisprudencia and also joined the editorial group of the opposition newspaper El Democrata. Within a few months though, the paper was banned by the dictatorship and its staff arrested. Ricardo, however, managed to escape and was obliged to hide with friends for several months before returning to school. In 1895 Ricardo was admitted to the Mexican bar and practised law a little while continuing his studies at school until he was expelled in 1898 for his political activities. Together with his two brothers he then worked as a clerk in several law offices in order to save enough money to start a new opposition newspaper. With money thus saved they were able to bring out the ﬁrst issue of Regeneración on August 7th 1900 with Jesús, Ricardo‘s elder brother, and A. Horcasitas as editors. For the ﬁrst few months of its life Regeneración was careful not to openly attack the dictatorship, but in December of the same year it changed its position from being just a law journal to an “Independent Journal of Combat’ and from then on vigorously attacked every aspect of the Díaz regime, based as it was on slavery and official corruption on the grandest of scales. This change coincided with Ricardo becoming editor in the place of Horcasitas. In February 1901 Ricardo participated in the ﬁrst Congress of Liberal Clubs held in San Luis Potosí. These clubs had been formed throughout the country at the initiative of Camillo Arriaga a mining engineer and former senator. Their aim was to combat the ever-growing inﬂuence the churches exercised in the running of the country. It was here that Ricardo was to make his first open attack on the Díaz dictatorship. While the other delegates were content to make speeches of simply an anti-clerical nature, when Ricardo’s turn came to speak he stood up and denounced the Díaz administration as a den of thieves. After that the wrath of Díaz was not long in descending. Ricardo and Jesűs were arrested the following May and sentenced to twelve months imprisonment for insulting the president. Despite the imprisonment of its editors Regeneración continued, printed clandestinely with the younger of the Flores Magón brothers, Enrique, taking over the editorship. Ricardo, though, still contributed articles from his prison cell and smuggled out by a group of sympathetic prisoners. At the end of the year, however, Regeneración was forced to cease publication. On his release from prison in April 1902, Ricardo took over the editorship of the anti-Díaz satirical weekly El Hijo del Ahuizote, aided by Enrique; Jesús having had enough of illegality, abandoned the struggle to practise law. In September the ofﬁces of El Hijo del Ahuizote were raided by the police and the presses etc., conﬁscated. Ricardo and Enrique were arrested and sentenced to four months imprisonment after being held incommunicado for over a month in a military prison. El Hijo del Ahuizote was forced to close but appeared again in November under the direction of Juan Sarabia. Ricardo and Enrique resumed work on the paper in January 1903 on their release from; prison, until April, when the ofﬁces were raided for a second time. Now the entire editorial group of ten people were arrested and imprisoned for five months for “ridiculing public officials.” Ricardo was again held incommunicado, this time for two-and-a-half months. While in prison the Supreme Court of Mexico forbade the publication of any article written by Ricardo. On gaining his freedom at the end of 1903 and faced with the ban on his writings Ricardo was forced to leave Mexico and seek exile in the U.S from where, or so he thought, he could continue the anti-Díaz struggle without persecution. In exile he was joined by Enrique and later by Librado Rivera, Juan Sarabia and Antonio I. Villareal, all co-workers on El Hijo del Ahuizote. 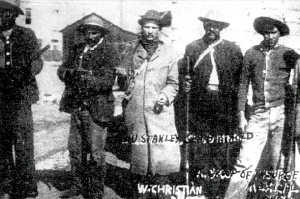 Ricardo and his comrades first settled in Laredo, Texas where they found work as labourers. Some months later though he moved to San Antonio with Enrique and Juan Sarabia where they were able to resume the publication of Regeneración in November 1904. However, during the following months an attempt was made on Ricardo’s life by an assassin hired by the Díaz dictatorship, the attempt being averted only by the quick intervention of Enrique. Because of this the exiles were forced to move again, this time to Saint Louis, Missouri, where Regeneración appeared again in February 1905. 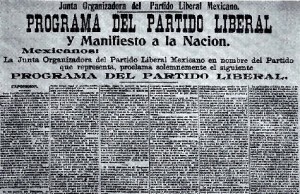 In September 1905 Ricardo founded the Junta Organizadora del Partido Liberal Mexicano with himself as President, Juan Sarabia as Vice President, Antonio I. Villarreal as Secretary, Enrique as Treasurer and Librado Rivera as a committee man. The function of the Junta was, and remained so until its disbandment in 1918, simply as a co-ordinating centre for liberal activities both inside and outside Mexico. Less than a month after the founding of the Junta, Pinkerton detectives raided the offices of Regeneración. The presses and office equipment were taken and Ricardo, Enrique and Juan Sarabia arrested. Released later on bail the three were forced to ﬂee to Canada fearing, not without reason that they would be handed over to the Mexican authorities. Meanwhile a reward of $20,000 was offered for the capture of Ricardo. While Díaz agents were harassing Ricardo in Canada, the P.L.M. programme was published in July 1906. This programme was written after as many liberals as possible had been consulted about its contents. For example the section on labour was compiled after consultation wit workers who had participated in the famous Canadian copper mine strike that had taken place hardly a month before the publication of the programme. Yet it was decidedly reformist in tone, even though it went far beyond the Mexican Constitution of 1917 (which was partly based on the P.L.M. programme). While reformist though many of its ﬁfty-two clauses were very advanced for the time, they included the abolition of the death penalty, the suppression of compulsory military service, complete secular education for children, a maximum working day of eight hours, the restitution of communal lands to the villages and the protection of all indigenous races. Ricardo himself wrote the accompanying manifesto and the programme itself would no doubt have been e truly radical document had Juan Sarabia not moderated much of Ricardo’s contribution. Early in September 1906, Ricardo and Juan Sarabia left Canada and went, secretly, to El Paso, Texas, to finalise plans for an armed uprising against the Díaz dictatorship, preparations for which had been going on for many months. Despite the arrest of Texas liberals by the U.S. authorities and the discovery of a large quantity of hidden arms, and the suppression of Regeneración, which had been run by Librado Rivera in Ricardo’s absence, the uprising began on September 26th 1906. The ﬁrst armed P.L.M. action ms the taking of the main plaza of Jiménez. Coahuila by a group of thirty liberals. They managed to hold the town for a day before being forced to withdraw. Four days later three hundred liberals attacked Acayucan Veracruz. They were near to success when their leader was wounded and the ill-armed liberals decided to withdraw. Several small-scale actions took place in the north of the country but the liberals were soon forced into a merely defensive position by the federales. ‘In October, Sarabia, who had crossed the border into Mexico was arrested in Ciudad Juárez and subsequently imprisoned by the dictatorship. On the same day the home of the Junta in El Paso was raided and all but Ricardo, who managed to escape by jumping from a window, were arrested. At the same time important documents on the P.L.M. groups within Mexico, together with the subscription list of Regeneración were found and immediately handed over to the Mexican authorities. The dictatorship then began the systematic repression of liberals throughout the country. On their side of the border the U.S. authorities followed the same example. Ricardo, meanwhile, on the run with the price of $25,000 on his head went ﬁrst to Sacramento, then San Francisco, finally, after narrowly avoiding arrest several times, he settled in Los Angeles where Antonio I. Villarreal joined him. Although he had been captured at El Paso, Villarreal had escaped as he was about to be handed over to the Mexican authorities. In June 1907, working clandestinely, they brought out the first number of Revolución which replaced Regeneración. Some weeks later Librado Rivera joined them. In August their hiding place was discovered and the three comrades were arrested without a warrant. During the arrest Ricardo was beaten unconscious when he tried to attract the attention of passers-by. The following day the “detectives” who had made the arrest, employees of the Furlong Detective Agency whose sole aim was the tracking down of the P.L.M. activists for the Díaz dictatorship returned to the offices of Revolución and removed all important letters and documents. Revolución continued publication under the editorship of several comrades who were arrested one after the other until the journal was ﬁnally silenced in January 1908. Ricardo, Enrique and Villarreal were tried in September 1907. The initial charge of “resisting an officer” was dropped and replaced with four other charges ranging from the murder of an unknown man in Mexico to the violation of the neutrality laws. One by one all the other charges were dropped leaving only the latter and for this “crime” the court decided that the three should be deported to Arizona where the offence was supposed to have taken place. While in Los Angeles jail awaiting deportation Ricardo made the final preparations for a second uprising against the Díaz dictatorship, the plans being smuggled out of the jail by Ricardo’s partner Maria Talavera. In June 1908 P.L.M. groups rose up in the state of Baja California, Coahuila. Chihuahua and Tamaulipas. But despite taking the towns of Viesca and las Vacas, Coahuila, the latter being taken by a liberal force of only forty men against the local garrison of over a hundred federales, the uprising was again a military failure. After the rising followed the usual repression and at the request of the Mexican government Ricardo, Librado Rivera and Villarreal were held incommunicado in Los Angeles jail for several months. In May 1909 Ricardo and his two comrades were deported to Arizona where they were sentenced to eighteen months imprisonment for the violation of the neutrality laws. While serving their time in Yuma and, later, Florence jail, the propaganda work of the P.L.M. was carried out by Enrique and Práxedis G. Guerrero. On their release from prison in August 1910 Ricardo, Librado and Villareal returned to Los Angeles where the publication of Regeneración was resumed in September, and the planning of a third uprising was started. While in prison, events in Mexico had given Ricardo much hope of the success of a new rising. The discontent of the people had manifested itself in many acts of petty revolt, and in May 1910 the town of Valladolid, Yucatan was taken by ﬁfteen hundred armed peones and held for four days until retaken by a large force of federales. The following month the towns of Bernardino Contla, Tlaxcala was taken in the name of the P.L.M. and held for a day. Madero’s new found revolutionary ardour was very surprising considering that only four years before in 1906, he had refused to give either moral or ﬁnancial aid to the P.L.M. during their ﬁrst anti-Díaz uprising, claiming that the uprising was unpatriotic, and that Díaz was not such a tyrant as the P.L.M. made him out to be. Despite this warning though many P.L.M. members joined Madero’s movement, believing his earlier lies and failing to receive any clariﬁcation of the situation from the Junta. All this fell in with Madero’s plans. By the end of January 1911 P.L.M. groups were active in the states of Sonora, Tlaxcala, Veracruz, Durango, Oaxaca and Chihuahua. In Baja California the town of Mexicali fell to a P.L.M. group on January 29th and on February 5th a large P.L.M. group under Prisciliano Silva took the town of Guadalupe, Chihuahua. On 14th Madero crossed the border into Mexico and assumed command of all revolutionary groups then engaged in the ﬁghting. Madero’s plans were upset though when the following day Gabino Cano, a P.L.M. member who had been lighting with the Maderists decided to join Silva’s column with all the men under his command. The united force would then undertake action independently of the Maderists. 1908, US Federal Bureau of Prisons: Prisciliano G Silva arrested by Texas Rangers in El Paso and imprisoned for violating US Neutrality Act. The following day Antonio I. Villarreal deserted the P.L.M. to join the Maderists, an act that hurt Ricardo deeply. Juan Sarabia joined Villarreal on his release from prison in June 1911. The months that followed saw a great increase in P.L.M. activities throughout the country, and in Baja California a large part of the state was under P.L.M. control. To combat these advances Madero resorted once again to the same treachery he had practised on Silva, claiming that by operating independently P.L.M. groups were “in rebellion against his government”, and in Altar, Sonora, twenty-eight liberals were murdered by Maderist soldiers. In May a peace treaty was signed between Madero and Díaz and with the latter’s resignation some days later Madero believed his political revolution had come to a victorious end. Not so Ricardo. For him the social revolution that he had for so long fought for was only beginning. He refused to accept Madero’s treaty and P.L.M. groups continued the struggle, this time against Maderist forces. On June 13th Madero sent Ricardo’s eldest brother Jesús and Juan Sarabia to Los Angeles to induce Ricardo to lay down his arms. The mission was a failure. Ricardo refused, saying that until the land was distributed to the peasants and the instruments of production were in the hands of the workers, the Liberals would never lay down their arms. The following day the offices of Regeneración were raided and Ricardo, Enrique, Librado Rivera and Anselmo Figueroa were arrested and accused of violating the neutrality laws. Later, Ricardo was freed on bail of $2,500, which was raised by P.L.M. groups around Los Angeles. “ . . .Liberty and well being are within our grasp. The same effort and the same sacriﬁces that are required to raise to power a governor — that is to say a tyrant — will achieve the expropriation of the fortunes the rich keep from you. It is for you, then, to chose. Either a new governor — that is to say a new yoke —or a life- redeeming expropriation and the abolition of all imposition, be that imposition religious, political or any other kind. 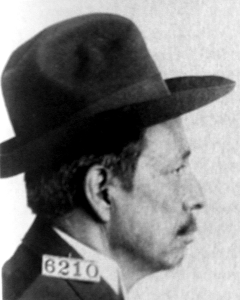 In June 1912 Ricardo and the other Junta members were tried in Los Angeles for the alleged violation of the neutrality laws and sentenced to twenty-three months imprisonment. During their conﬁnement Regeneración continued publication, edited by a group that included Antonio de P. Araujo, Blas Lava and Teodoro Gaitán. Ricardo again threw himself into the struggle on his release from prison in January 1914. In June of the same year, through Ricardo’s initiative, the International Anarchist Congress that was to be held in London the following September decided to put the Mexican Revolution on its agenda, and it was hoped to send a representative of the Junta to participate and explain the Mexican situation fully. One of the reasons for this was to refute the very anti-Magonist attitude adopted by Jean Grave in Les Temps Nouveaux and Luigi Galleani in Cronaca Sovversiva. Unfortunately, owing to the outbreak of war the congress never took place. In 1915 Ricardo and the other Junta members together with their families and friends rented a small farm on the outskirts of Los Angeles, where they founded a small commune. Towards the end of the year Regeneración resumed republication after it was forced, for financial reasons, to stop in December 1914. It was here that Ricardo wrote his ﬁrst play, Land and Liberty, which was ﬁrst staged in Los Angeles at the end of the year. In February 1916 Ricardo and Enrique were again arrested, this time for attacking the Carranza regime. During their trial Ricardo was so ill that he could only attend the court to hear the sentence of twelve months imprisonment, Enrique receiving three years. The following month Ricardo was released on bail, which was posted by Emma Goldman and Alexander Berkman, pending an appeal. During the remaining months of 1916 and all of 1917 Ricardo continued to bring out Regeneración, although now only on an irregular basis, while recurring ill health forced him to stop writing for some of the time. 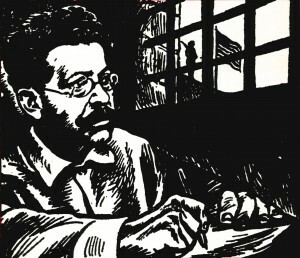 Ricardo was again arrested, together with Librado Rivera, in March 1918 after they had issued a manifesto To the Anarchists and Workers of the World in which they predicted the impending fall of the capitalist order, and urged all anarchists to prepare the peoples’ minds for this great event. Charged with sedition under the Espionage Laws Ricardo was sentenced to a savage twenty-years imprisonment and Librado to ﬁfteen years. While serving his sentence, first in McNeil Island Prison and later in Leavenworth Penitentiary, Kansas (where he was regarded as the most dangerous prisoner in the prison) Ricardo’s health began to deteriorate seriously and his eyesight began to fail. Despite this, all medical treatment, other than the most basic was denied to him. In 1920 he was offered a pension by the Mexican Government, which he declined, saying that as an anarchist he could not receive without shame and remorse money that had been stolen by the government from the poor. 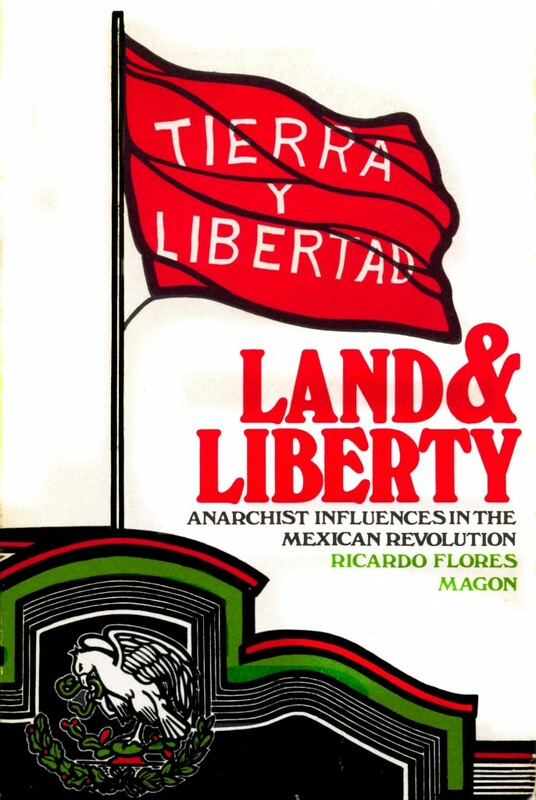 In 1922, with the founding in Mexico of the anarcho-syndicalist CGT a campaign for, the release of both Ricardo and Librado grew, and several strikes and the boycotting of U.S. goods took place. Unfortunately, this action came too late. On November 22nd 1922 Ricardo was found dead in his cell. According to the prison authorities the cause was a heart attack, but it seems almost certain that he was in fact murdered. Now offering no threat to the authority of the Mexican government, the Chamber of Deputies offered to pay for the return of Ricardo’s body to Mexico. His partner and his comrades rejected this offer. Instead, his body was transported by the Confederation of Railway Societies at their own expense. He was buried in Mexico City on January 23rd where a crowd of over ten thousand workers followed the coffin to the Panteón Francés. In 1948 Ricardo’s body was exhumed and re-interred in the Rotonda de los Hombres Ilustres. 2. Regeneración, September 3rd 1910. 3. 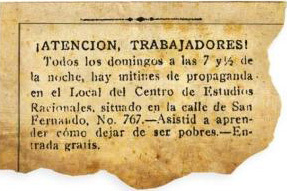 Regeneración, December 10th 1910. 4. Regeneración, February 25th 1911. 5. Regeneración, September 25th 1911. 6. Letter of Enrique Flores Magón dated October 31st 1916 printed in Freedom, February 1917.